Although the 996 is a completely different car than the previous air cooled models, Porsche continued to carry over their “T” style air distributor intake that has been employed since the 60’s. 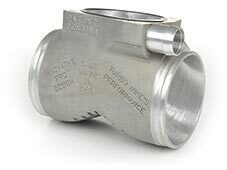 The IPD Plenum delivers substantial power gains for the 98/99 Cable cars with it’s patented “Y” design. The IPD Plenum optimizes air flow by increasing air flow velocity and reducing air flow turbulence inside the intake of the 3.4 liter engine. Performance improvements from the IPD Cable Plenum are quite impressive, delivering around 28 HP and 26 Foot Pounds of Torque all at the wheels. 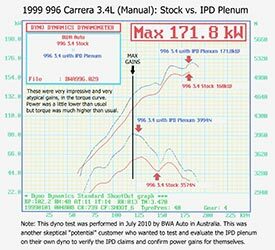 As you can see, the IPD Plenum delivers max gains in the mid range where we all need it and enjoy it most. This particular test saw extraordinary gains in the torque department, far above our claimed power gains. This particular test was performed by BWA Auto in Australia and needless to say their skepticism was soon replaced with very pleased disbelief. 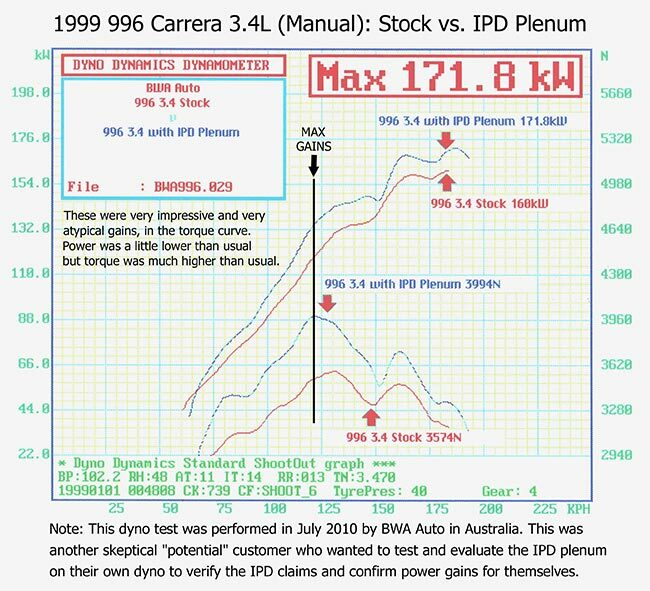 They reported that the car feel considerably faster and power gains were definitely noticeable by the “seat of your pants” gauge after installing the IPD Cable Plenum. If any other Aussies are looking to add some solid performance power to their late model Porsche then contact the BWA Auto team at the link on the bottom of the page. Stay tuned for our next Plenum test. In our continued effort to deliver fresh and meaningful articles we will be posting ALL of our plenum tests, both past and present, for our viewing audience. Thank you for all your continued interest and spending time at ipdplenum.com.